Koh is India's first modern signature Thai Restaurant, situated at The InterContinental, Marine Drive, Mumbai. The sophisticated, elite and professional class of Guests induced Koh to consider restyling the conventional menu card into an interactive menu solution. According to global research, the sales of food increase by 20% when a dish is displayed visually. 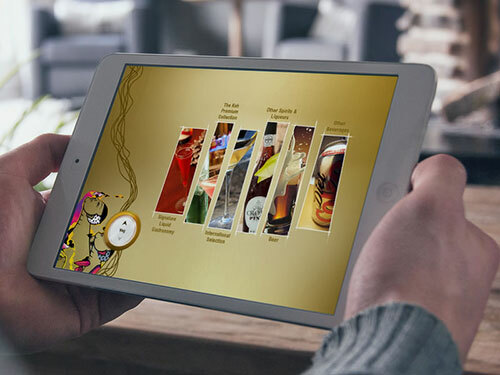 Based on this research, WITS Interactive strategised to design this interactive eMenu in a visually appealing package. The eMenu not only listed the culinary offerings but also worked as a Branding platform, by highlighting the culinary achievements about Ian Kittichai, the renowned Chef and title holder of 'Golden Hand Chef'. The eMenu was designed and executed to be used on the iPad. The aim was to create an interactive eMenu suited to the needs of Koh's Guests. "Food temptation can never get better than this". The gold tone of the entire design was in perfect sync with the brand, giving it a classy look and enhanced the overall user experience at Koh, making it a memorable and definitely repeatable experience for the guests.